The leaders of Pakistan's governing coalition have made progress in Dubai on their pledge to restore the judges sacked by President Pervez Musharraf. 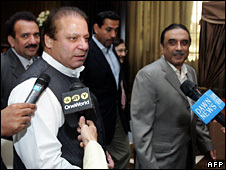 An aide to PML-N leader Nawaz Sharif said he and PPP chairman Asif Zardari agreed on most issues, but differed "on some legal and constitutional matters". Chaudhry Nisar Ali Khan said they would continue their discussions on Thursday. After winning the recent parliamentary elections, both parties agreed to restore the judges by the end of April. Analysts say the failure to resolve differences over the issue has put the 30-day-old coalition government under strain and could strengthen the president. The talks between the coalition partners started on Wednesday at a hotel in Dubai, where Mr Zardari lived for many years with his wife, former Prime Minister Benazir Bhutto, who was assassinated in December. After almost seven hours of negotiations, the two men agreed to meet again on Thursday in an effort broker an agreement, Mr Nisar told reporters. "A lot of progress has been made... there is consensus on most issues but difference of opinion on some legal and constitutional matters," he said. "The final decision on the issue will be made tomorrow," he added. Before flying to Dubai, Mr Sharif said he wanted the coalition to stay together, but warned of "disastrous consequences for democracy and Pakistan" if the judges were not restored as promised. He has insisted that judges who replaced those sacked last year should lose their jobs, because they had acted unlawfully in upholding Gen Pervez Musharraf's declaration of emergency rule in November. He suggested that the old judges' re-instatement should to be kept separate from constitutional reforms proposed by the PPP that include plans for the judiciary, but he said he would be "happy to discuss the package". Mr Zardari has argued that constitutional amendments are needed to prevent the judicial abuses that have occurred in the past. These would limit the tenure and powers of the chief justice and prevent judges from getting involved in politics. However, coalition insiders say Mr Zardari is also worried that, if restored, the judges could undo an amnesty deal that cleared him of corruption charges. On Tuesday, Information Minister Sherry Rehman of the PPP said that restoring the judges required legislation that "needs some time". "I don't think in this situation the coalition is threatened," she said. The judges, including the chief justice of the Supreme Court, Iftikhar Chaudhry, were sacked after Mr Musharraf declared the state of emergency. At the time, the Supreme Court was preparing to rule on whether his re-election earlier that year was legal. They were also due to rule on whether an amnesty the president granted Ms Bhutto and Mr Zardari in a number of corruption cases was legal.